-Valerie: Val's hit a growth-spurt and is now officially the tallest of the kids rather than being tied with Grant. 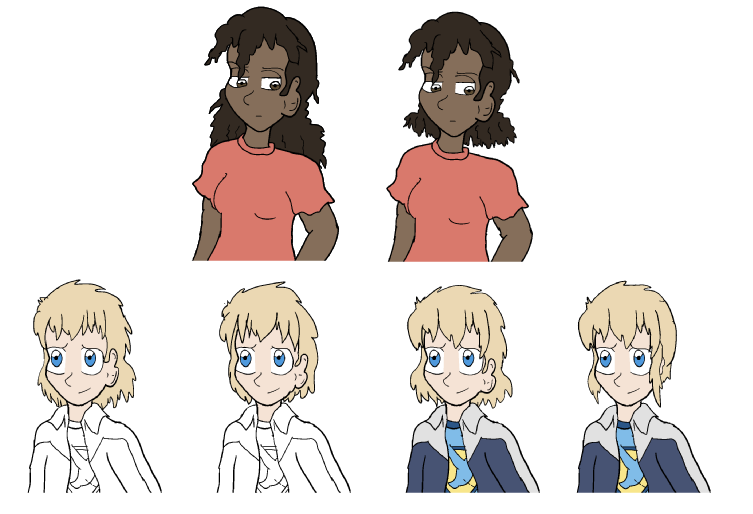 We did three different possible designs for Val's hair (one with it even longer, another with it shoulder-length, another super-short), eventually settling on the current one with the super-short cut on the basis that it looked better then the others. .... Yes, we know it looks weird to have the gay member of the group cut her hair after coming out, but it's really just that we thought she looked cool like this. I'd mention the other tweak we made to her design, but Nicky beat me to it. ^^ Really love that joke. -Lore: Lore, to her presumed disappointment, didn't get any taller and is still the shortest member of the group. Worse yet, we actually slimmed her down and made her thinner, under the assumption that having super-strength would make it hard for her to bulk up, and that the Marvelous Man fight probably burned off the last of her baby fat. Her hair is also much bigger and fluffier, and she now has the wide, innocent eyes you see on child characters. She used to lack those to imply intelligence, but now we're coing all in on her being cute. She also has the single little eyelash that Jenny sports, but those are hard to see in the night colors. She also now has Idiot Hair. I think Martin just threw that out randomly and I just friggin' LOVED the idea of putting it on her. I really struggled drawing it for the first time but I latched onto the idea hard. Jenny- Jenny has one of the simplest design-tweaks in that we just put more emphasis on the bottom-heavy design, with her legs being even more massive and muscular and her upper half more frail. She's also wearing her hair in a ponytail now, though the plan (as you can see in the banner) is to put her hair in pigtails when in-costume. Her bangs are also curly, like the rest of her hair. -Nicky: Nicky, like Jenny, just emphasized what was there, trying to make him chubby and more adorable-looking. His haircut REALLY needed attention, as I did NOT enjoy how it looked in retrospect. His new haircut I think looks way better while still clearly being the character. If you're curious, there is an explanation in-universe for it; the school had a special pair of scissors that could cut rubber-hair, and now that hes back with his parents he can't get a good cut so it's just getting super-bushy. -Grant: Grant was another one where we went with several different designs in how to tweak his hair, from super-short to even longer. Unlike Valerie, we settled on making it longer than ever, and in drawing this page the further tweak of making it slightly messier and unkempt. He's also now sporting a trendy jacket we'll be wearing quite a bit. The other kids are all in winter clothes just to imply this is a month after the Marvelous Man fight (it's... unclear how time works but this should be December/January-ish in-universe now) but with him, that jacket's going to be something he often wears in his civilian look. The joke between both the new jacket and the longer hair is that he's clearly trying to emulate Alex Rayne.... But to be honest, the jacket probably also is a nod to Jake; Grant's coat has faux-fur trims and linings like his. -Andy: Now he's got a hoodie! .... Done. Okay, no, clearly, we had more in mind for Andy, but he wound up with his hood up, so we don't get to see it. ^^ Fortunately his ninja-costume hides his face, so we don't have to wait until he takes his hood down to put up the new banner. You guys like? Also Sapphire City has a street called Galahad. I like the idea that the city just has a general heroism motif going for it, I dunno. Hey, look, Val, Lore, and Jenny have the hair we showed off in that anniversary picture no one really said anything about! If wondering, no, these new designs weren't done in chunks, we just wanted to preview some of them before we did others. Kind of funny, a lot of what we actually wound up sticking with on all of this was my own bit of suggestion - the short hair for Valerie and longer hair for Grant both came out of some edits I made to the designs we came up with, plus I'm the one who threw out the ahoge idea for Lore - but Adam kind of already really burned through the details on everything. But hey, I've got pictures! Yeah, there were the other designs we batted around for these two; think in both cases we went with the best option on the table, although by all means feel free to chime in with your opinions on the subject. Guess I should get into my own individual thoughts on everyone then, although first off, should mention that the new costumes we premiered last chapter were designed with these new looks in mind; they were done together and Adam pretty much just decided to go ahead and integrate them into the last chapter early since he was liking the look of them as it was. Is a fairly big part of why Andy's now the only one with a mask not counting Jenny's visor, while already rather pointless given how easy the kids would be to identify they're especially unneeded now that they're public. Valerie: With the whole coming out then lopping her hair off thing, yeah, we're pretty aware of how that could read, we just thought it'd be a good look for her. Of course, it's probably mitigated by the fact right alongside it we've made her body more feminine and have her wearing a skirt, should go to show we're not going to start shoving her in stereotypical roles or anything. Beyond that though I think she actually has my favorite of the new designs. Think it just fits her personality well and makes her a lot more eye-catching, particularly combined with having her hit a growth spurt and really emphasizing how she's the oldest member of the group. Granted for the foreseeable future it'll probably level out at that and this joke with Nicky is probably the most attention we'll draw to the matter. Her costume's pretty much just continuing off the existing template with her, moving back toward the more sleek look compared to the baggier one she had before. Not much to it. Biggest outside the box change is really just integrating some red into the costume. Grant: What's funny is I think the coat was actually Adam's idea. As mentioned it's going to be something of a fixture of his clothing going forward - felt like both a natural extension of his tendency to dress in layers plus just a good touch you'd expect out of a fanboy. We actually flirted with the idea of incorporating the coat into his superhero gear and wearing it over his costume in place of a cape, but we never seriously considered the idea and aren't really fans of how it looked so yeah, I wouldn't be expecting anything like that unless we end up doing some chapter in extreme cold at some point or something (and that's ground we already covered anyway). It'll just be a casual thing. Big part of his costume was basically just some streamlining, not a gigantic change there. We actually considered a ton of other possible color schemes with it, offhand mulled about ditching the white and yellow for black and red (and the white's now all gone besides the interior of the cape anyway) but on the whole I think it's pretty much landed where it should. Lore: Wanting to say we initially flirted with the idea of the idiot hair on Grant before we committed to it with Lore but I'm not 100% on that one. I do know that Adam was having trouble figuring out how to fit it into her design which led me to doing it while coloring what we came up with and him learning from example with that. You might've noticed a tendency toward them of late with our comics - Lore already had a smaller one starting to develop in the last chapter, Sareena and Misty've both gotten them lately (as did Marina), Crimson Blade had one in the last page... Yeah, it's not something we intend to overdo it on or anything, this isn't Danganronpa (although that is probably what inspired me to bring the idea up), but it is an aesthetic choice Adam's wound up getting pretty into. I think her costume might've been the most up-and-down of the lot, went through a lot of revisions and a bunch of color schemes. The sleeveless look came down to something we've been trying to kind of emphasize with her costume since the first redesign though, giving her more of an old-timey strongman look. What with her being a fangirl for Trixie it kind of makes sense on a motif level and it just contrasts nicely with how short and thin she is. Think this particular color scheme was kind of Adam's doing - I threw out a ton of possibilities and wanting to say he suggested trying this specific combination from what all I'd done, and this is what ended up sticking. Do know at least at a point the design was the same as the final except with yellow instead of pink. Jenny: What's funny is that the most drastic change we've made to Jenny isn't visible either within this page or in the banner - a lot more detail going into her legs, making them look much more muscular and fleshy. Wearing pants in both kind of covers those up but is something we'll likely see before too long given how often we catch her in shorts. Might even end up popping up within this chapter at some point, but don't quote me on that one. As for the swapping the hairstyles thing... Yeah, that kind of just amounted to a desire to shake things up and deciding the pigtails look cooler with the running, nothing much to that particular move. Not a huge amount to say on her costume offhand, pretty much just some refinement and I feel like a better color scheme. For as hard as it was to come up with an initial costume for Jenny she's pretty much settled into a set sort of pattern with them at this point. Nicky: His hair was probably the most in need of some refinement. While the poofy sort of look it had before was appropriate to the character, we did want to move him toward something a bit more little kid-ish and scruffier. Making him a little bit more chubby kind of fit with that same sort of thing, just a good look for the character. If you're wondering, yeah, we'll probably be sticking to the overalls thing (it's what he was wearing in the design sketch for these, actually) but you know, this is probably taking place in late December / early January at night so not really an ideal time to not be wearing a jacket. His costume went through a lot of adjustments in its own right. Offhand one might've noticed that his chest logo now says PB instead of just P - it'd been batted around for awhile renaming him to Putty Boy and that's kind of the intent of that move, just don't think it's really had a chance to actually come up in the comic yet. Just a bit more cute and sidekick-ish, although what's funny is alongside that tried to give him a little more serious of a color scheme. We batted around a ton of ideas on that one - offhand there was a primarily blue with white and red trim one that got mulled over and a mostly yellow one with black and red trim, but I think skewing relatively close to the old one by still having it mostly red was the best call. Andy: His costume was basically just altered to make him look more Robin Hood-ish and to increase his visibility. Not that we wanted to make that a gigantic change given he's still supposed to have a ninja motif, but dark green-on-black stands out better than dark blue-on-black does. As for what's actually changed about him without the costume, we'll get to that. Aaaaand I wound up going on way longer than Adam did. Funny that, but hey, one of us had to talk about the costumes. Very interesting, wonder what's going to happen next, and is Val staying with Heather's family instead of her own? To be fair, I think she likes her girlfriend’s family more than her own (Nicky excluded), so it wouldn’t surprise me. Honestly I feel pretty certain most readers, including myself, like Heather’s family more than Val’s too (again, Nicky excluded). Your right Rastaba about a lot of the readers likening Heather’s family more than Val’s. Truth be told I think Val’s mom and dad does not even like her, that they are scared of her hell I bet they were scared of her even before she got her powers.